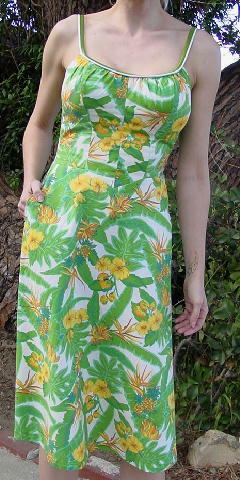 This vintage (purchased in the mid-1970s) sleeveless dress is a De Weese Design and is from Swim & Sun Fashions Los Angeles CA, and was made in the USA. 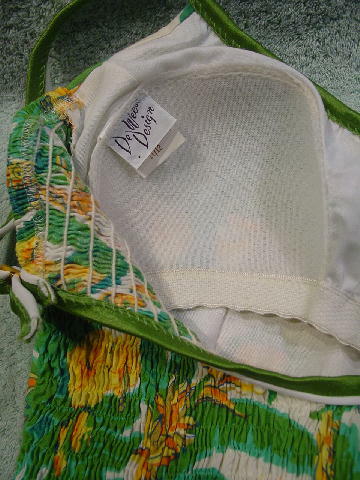 It has a built-in bra in the front and a back crinkled elasticized area in green and white in a swimsuit-type fabric. There are adjustable 12 3/4" long by 5/8" wide shoulder straps along the U shaped back. There is a somewhat wide skirt. It has an offwhite background with a design pattern of pineapples, bananas, mangoes, tropical flowers, and leaves in yellow, pale orange, mustard, and various shades of green. The tag says 11/12, but it fits like a size 6/8. The back center is 6" lower than the front center. It's from a former actress who hasn't worn it since the late 1970s. She gained weight and it has been sitting in her closet for decades. top center to bottom 36 1/2"